It's that time of the year when we start to clear out and refresh some of our display areas in time for Christmas (preparing for Christmas in July... yes, we're that prepared!). But that means one great thing for our customers - discounts! We're pleased to say that our Big Sleuth Boldmere Bear Cub "Clawd" has arrived safely and is now proudly on dispay within our The Garden Room coffee shop at Hall's Garden Centre. We welcome all visitors big and small who are following the Big Sleuth trail in Birmingham and Boldmere to pop in and visit Clawd and even take a selfie with him if you wish! Clawd has been designed by the fantastic pupils at Boldmere Junior School, who have written special individual messages that have then been collated together into one inspiring collage and printed onto Clawd's body. Read more about Our Big Sleuth Boldmere Cub Has Arrived! 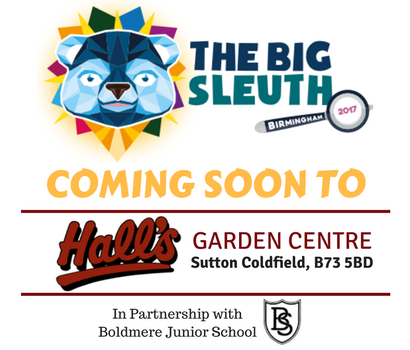 As part of The Big Sleuth in Birmingham, Hall’s Garden Centre will be providing a home to one of four bear cubs within the Boldmere area.